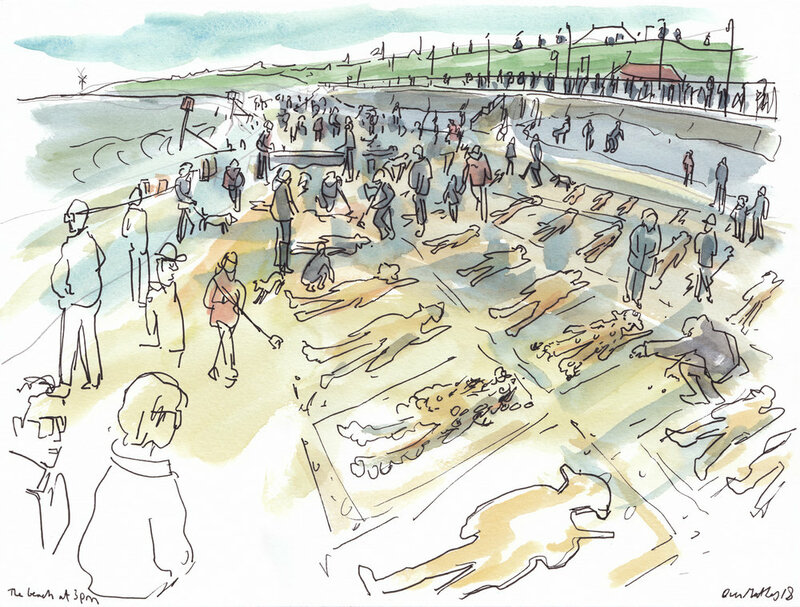 I was commissioned by Seachange Arts to document Danny Boyle’s ‘Pages Of The Sea’ WW1 Centenary Commemoration Event at Gorleston beach, Norfolk on the 11th November 2018. 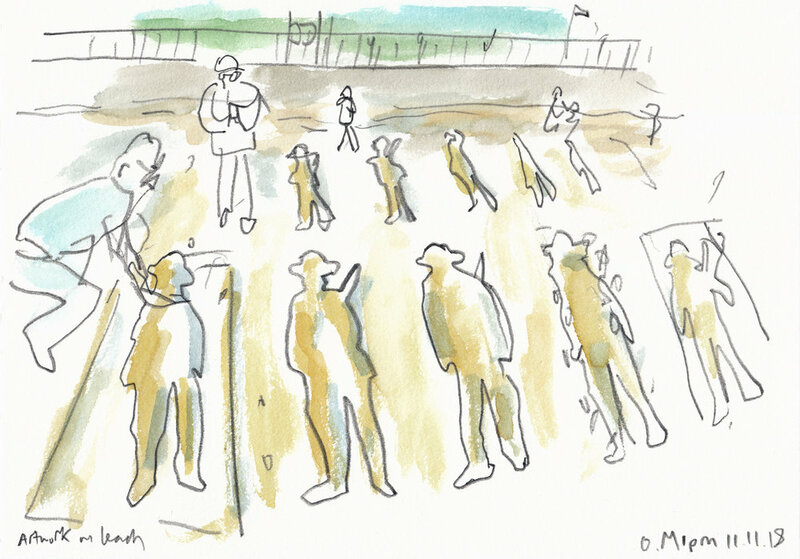 The national art event was held across beaches all over the country, whereby people gathered to make either portraits or stencils of WW1 soldiers. These would then be washed away by the tide later that day, allowing people to say a collective goodbye. 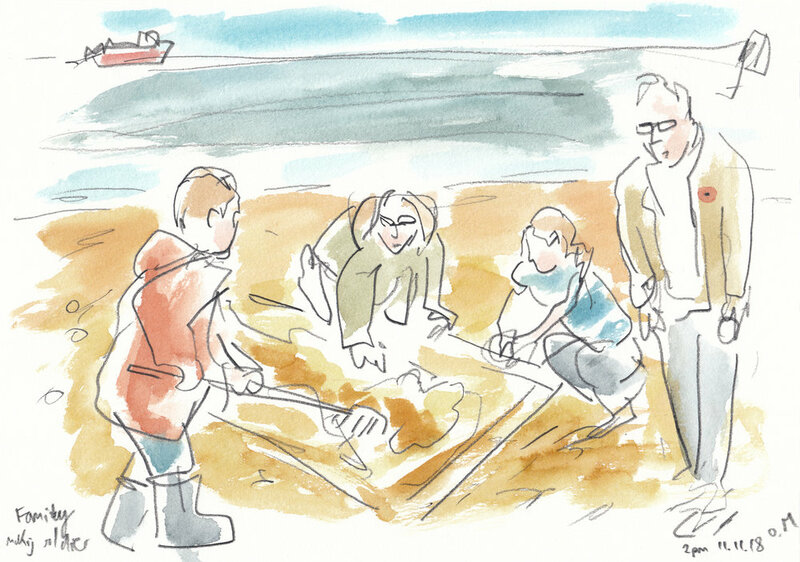 My job was to draw the event as it unfolded over the course of three hours, I ‘live’ shared the illustrations as I completed them with the organisers for them to share on social media as the event happened. 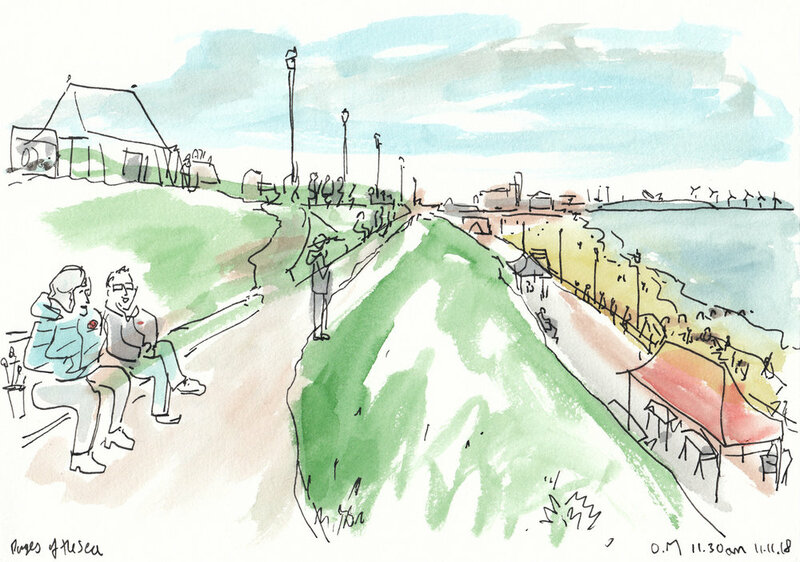 My drawing of the 2 minute silence was shared by the national event organisers themselves, bringing wider exposure to the event at Gorleston. It was an honour to be at the event on the day and help record it for posterity. There were people of all ages and backgrounds all getting involved in making stencil shapes of soldiers on the beach. In several instances the whole family were involved and I enjoyed capturing a few of those moments. Below are my drawings from the day in the order I completed them, I recorded the time in the bottom right. 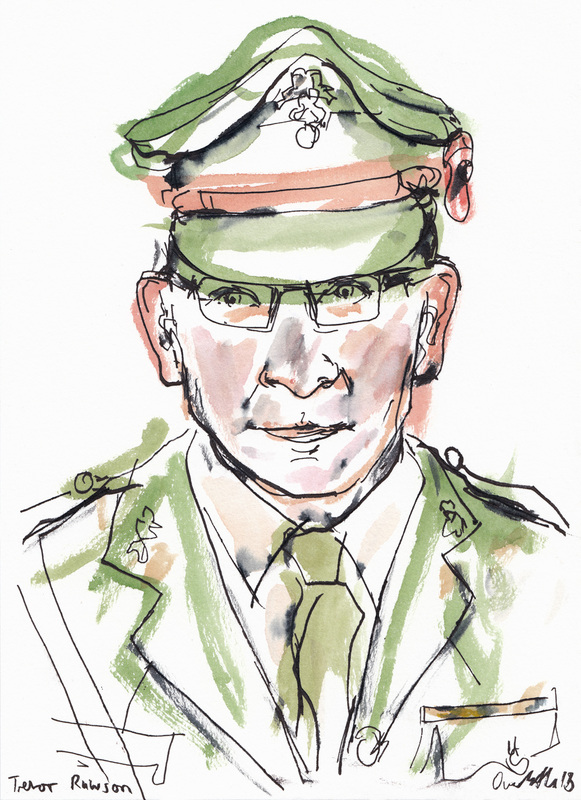 On the day I met Trevor, an ex-serviceman who was happy to pose for a quick portrait as the day drew to a close. His WW1 army uniform was a talking point and it was poignant to be seen on the day. 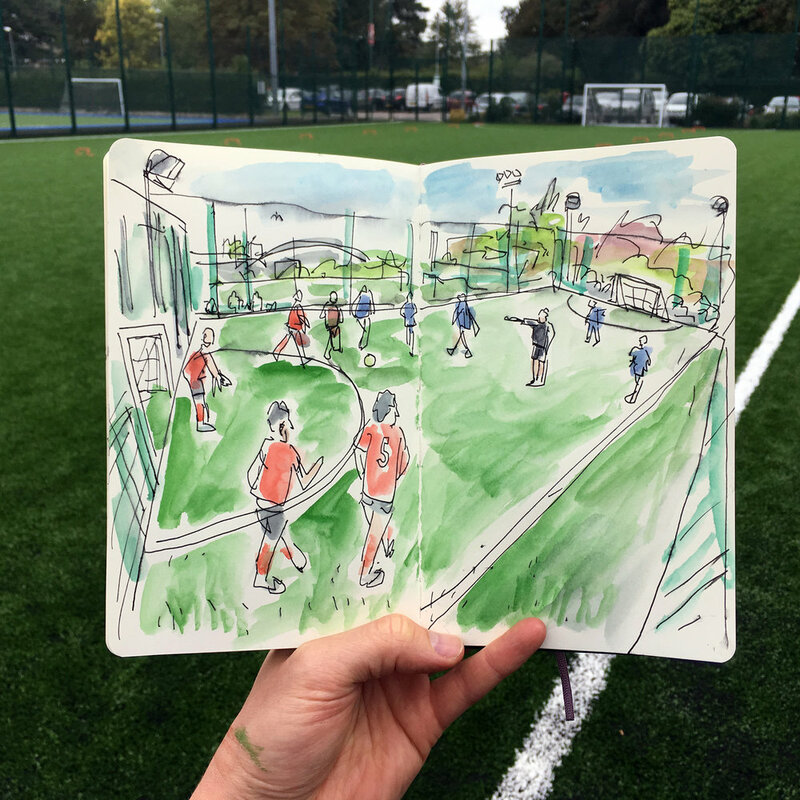 I was recently commissioned by the UEA Sportspark to draw some of it’s facilities on location to help show people the wide range of activities you can do there. I literally only heard about this event days before it happened. It sounded like there would be lots to capture so I jumped onboard one of the vintage buses that was running from Norwich to Wymondham on the day and spent a few hours milling around in the crowds capturing some scenes. The interior of one of the Vintage buses that Eastern Transport Society put on from Norwich to Wymondham. Semi-intentionally I only drew with ‘vintage’ equipment, so old dip pens and indian ink with watercolour. Now this did result in me tipping inky water all over myself along with coming home with black fingertips, but it’s fun to make a mess sometimes! 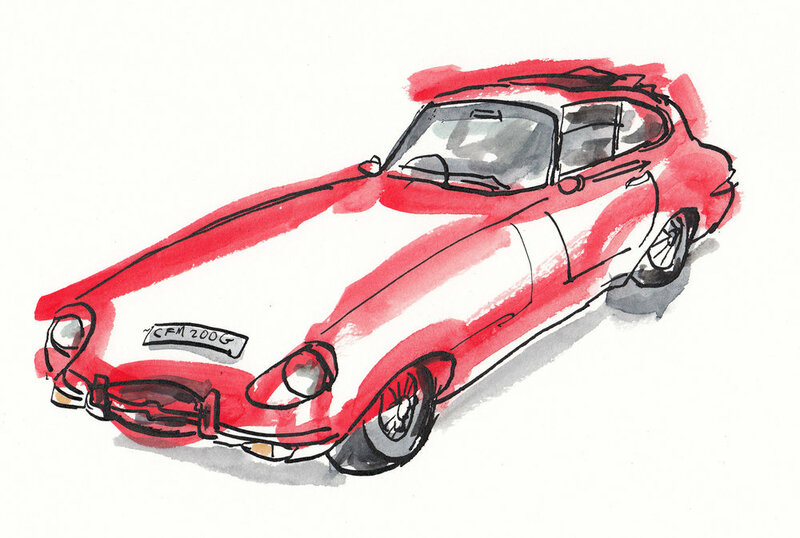 A nice E-Type Jaguar, drawn as quickly as possible in between the crowds. “Am I in your way?” – “No, that’s ok I can look over you!” – if you are the owner or know the owner get in touch as I should of got your details to post this to you! Chris Bonnick, a volunteer for the National Fire Museum as drawn on location. I managed to see a fair bit but couldn’t draw everything I wanted, so must head back next year. Very impressed with the organisation of this event – great turn out and loads to see. Was great to see the market town bustling with life of all ages. Out of all the subjects to draw my highlight was drawing retired fireman Chris (above) there’s nothing like drawing someone there and then at an event. It’s a leap of faith for them as you could be a weirdo and it’s a gamble for you as this is a one shot job. Mess it up and that’s it. Maybe that’s why I love drawing like this so much – it’s an adrenaline rush. You are on the edge of going wrong with any pen stroke. But with great risk comes great reward. A blank page needs to be attacked. No pencils, no rubbers – just make a mark. I’m ranting now – anyway glad I went. Got an event you would like drawn? Get in touch. 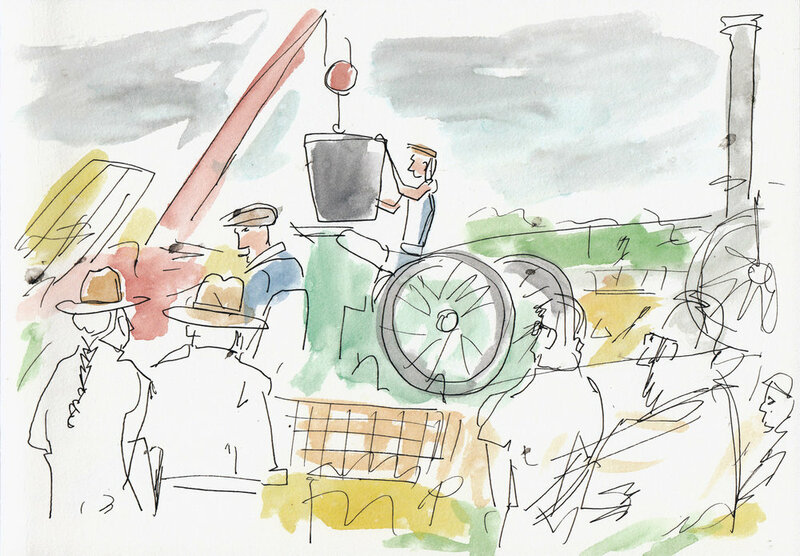 I visited the Annual Vintage Working Show at Little Ellingham on the 12th August. I love documenting live events, and this one was in the village next to where I grew up in – so familiar territory! 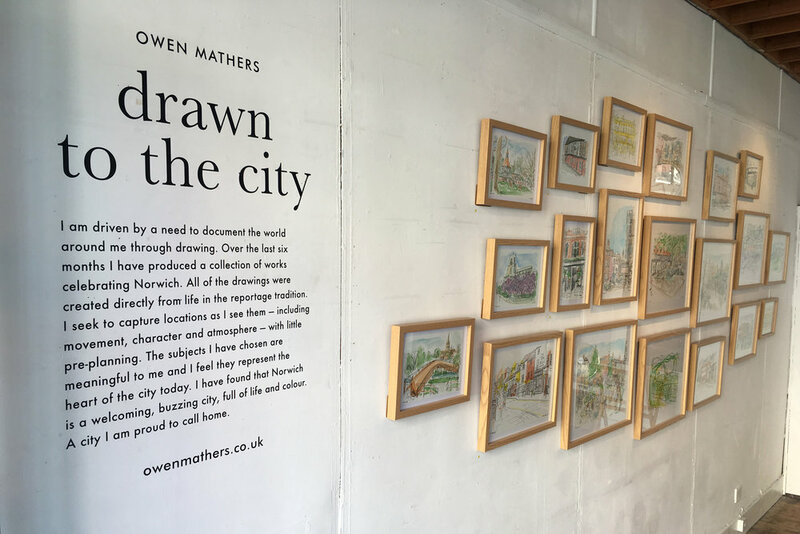 I held my second solo exhibition ‘Drawn to the City’ at Studio 20, Norwich from the 6th-8th July 2018. My recent event coverage work for the Norfolk & Norwich Festival was featured in the EDP on the 26th May. 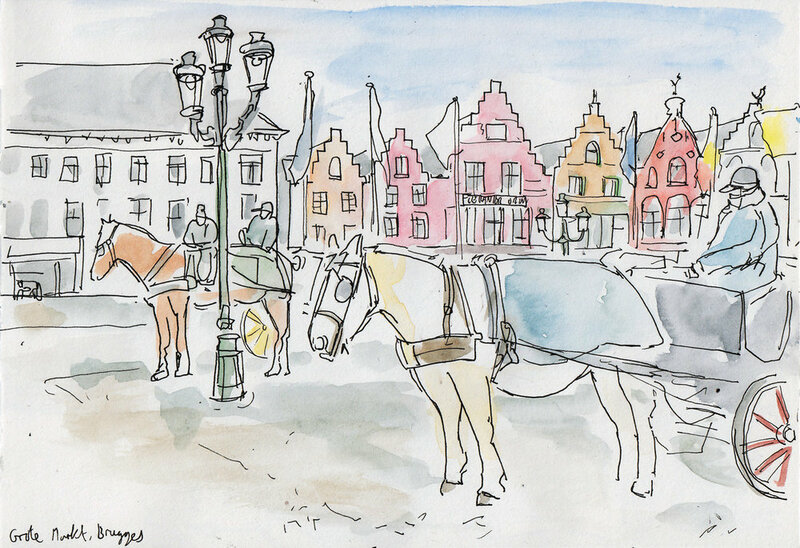 I had given an interview the day before, and spoke of my process in creating the drawings on location. Great to have my work featured! Read the full article at the EDP website. I recently spent a weekend in Bruges, Belgium for a Winter break, myself and my girlfriend were attracted by the promise of good beer, chocolate, waffles and medieval architecture. Bruges did not disappoint, every street is cobbled and lined with medieval buildings. From the picturesque Markt Square, with the multi-coloured guild houses and imposing Belfry Tower to the canals and bridges, there is plenty to see. 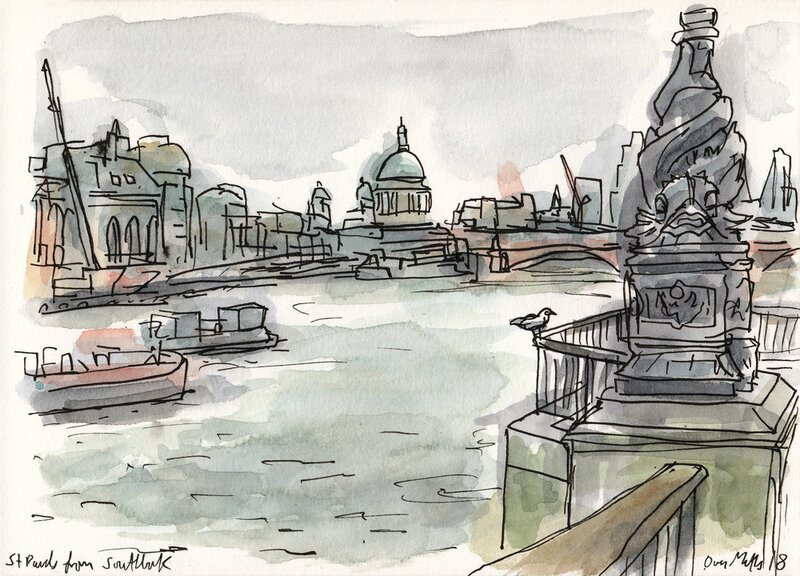 I visited the capital last weekend to go to the ABBA exhibition at the Southbank Centre with my other half, and did some quick sketches whilst out and about. 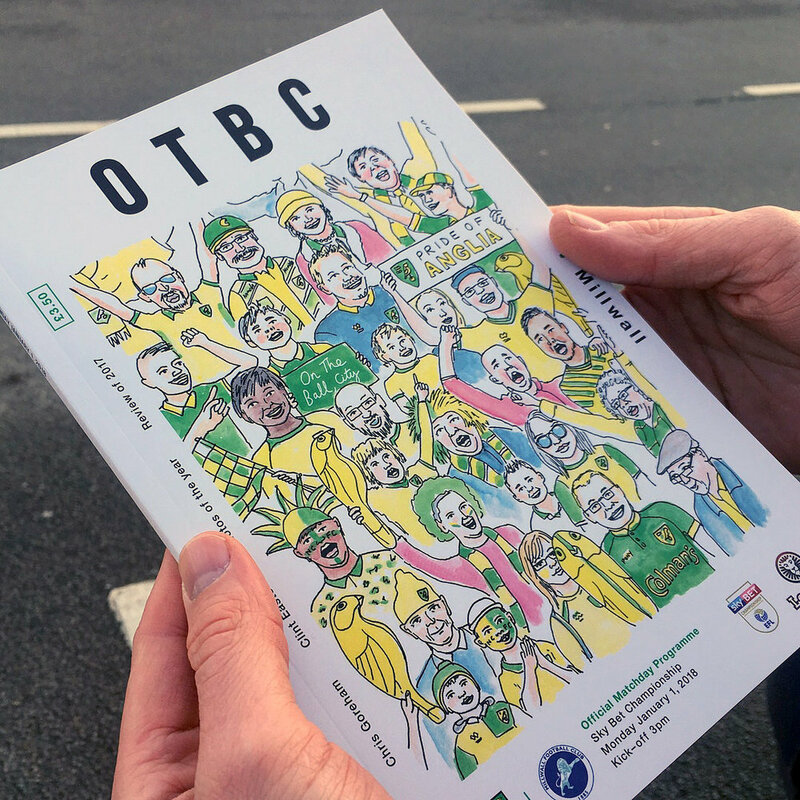 Just before Christmas I was approached by Patterns of Play to produce a cover illustration for the Norwich FC home programme. It was to be for their first game of 2018 with Millwall. Due to the Christmas shutdown the artwork had to be completed that week, giving me not long to get the job done. I love a tight deadline so I jumped at the challenge! Drawing whilst attempting to walk the Peddars Way from Suffolk to North Norfolk. A day spent retracing my steps in the capital through drawing on location. I ran the London Marathon this year and took along my sketchbook. Here's the scene during the Christmas day present opening ceremony at my family home. Mum dealt the presents whilst the rest of us waited in anticipation. During the end of October I took part in Paint Out Norwich, one of the UK’s leading plein air art competitions. Back in the first week of September my girlfriend and I spent a relaxing week in North Cornwall, calling in on Bath on the way there and Bristol on the way back. I attended Latitude for the first time this year and obviously took along a sketchbook! 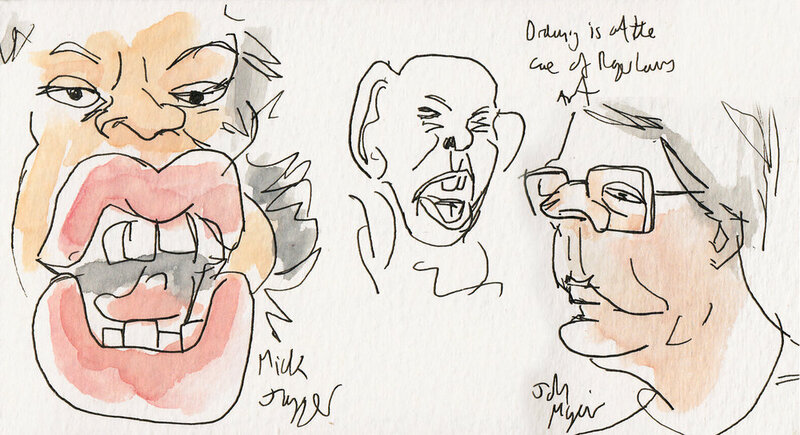 On Friday 10th June I had the pleasure of being asked to do a Live Drawing event at The Alley, a new bar/café next door to Moosey Art Gallery in Norwich.